The Conductor is a Troodon and a special friend to Buddy and his family. 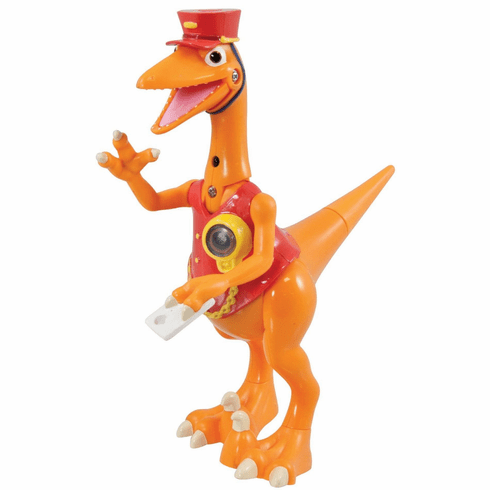 He becomes one of Buddy's heroes because he is the Conductor of one the most awesome trains of all, the Dinosaur Train! The Conductor is very intelligent and is happy to explain facts about dinosaurs, the places they visit and even how the Dinosaur Train works. This take-charge troodon plays over 40 sounds and phrases when you push his head. Press his pocket watch, and it lights up as he sings. You can even move his claw to punch your train ticket. The more characters you add to your collection the more sounds and phrases each will make as they great each other and converse. Approx. 7'L x 4'W x 8'H. Requires 2 'AAA' batteries (included). Made of plastic.